Mix ½ cup Borax with 1 gallon hot water, and add a few sprigs of fresh thyme or a couple drops of (not much!) Tee Tree oil, or Peppermint Oil, let steep 10 min., strain (if you use thyme) and keep in a spray bottle. 1/2 cup borax dissolved in 1 gallon of hot water was tested for one year in a California hospital, and found to meet all state germicidal requirements, according to The Clean Water Fund. Microfiber alone removes 99% of bacteria with nothing more than water, giving even most commercial disinfectants a run for their money. 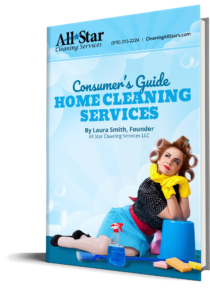 Steam cleaners (which can be purchased online or at stores such as Wal-mart for as little as $30) offer complete surface disinfection with no chemical use whatsoever. Vinegar and peroxide are both natural disinfectants. Tea Tree Oil is a powerful natural antiseptic, germicide, antibacterial, and fungicide. I recommend 7 drops per 32 oz bottle to disinfect. Grapefruit seed extract has been proven in laboratory tests to be more effective as a disinfectant than chlorine, colloidal silver, and iodine. The United States Department of Agriculture tested GSE and found it was even effective against Foot and Mouth Disease and Avian influenza. I recommend 20 drops per 32 oz bottle to disinfect.